Let me tell you guys about my new t-shirt. No matter how many dresses and skirts I wear, I'll always be a jeans and t-shirt girl at heart. I own a ridiculous amount of tees and love having cute designs and patterns on them. I was really excited when I heard about T-Post. It came with the slogan: The World's First Wearable Magazine. Intriguing, I know. What T-Post do is, every 6 weeks, they pick up a real live story and design a graphic for it, which goes on the front of the t-shirt. Then on the inside they write an article about it. So it is like a magazine: artwork on the outside and the print on the inside. The story they choose is an usually an interesting one, but one that the mainstream media may not have picked up on. think its a great concept. They use fashion and art to spread the word about new and interesting stories. Its also a great way to get a conversation started. Someone comes up to you and says 'nice t-shirt' and you can tell them the interesting story behind it. The one I got was about the death penalty. It has a noose on the front and the story is that people in the US want to abolish the death penalty, simply because it costs too much to execute someone. I'm not going to go in detail about the article, but you can read it, along with others on their website. My tee was designed by David Foldvari, and after googling him, I've seen that his illustrations are amazing. Also, I just wanted to briefly mention a product I heard about. One of the things I love about blogging is getting emails about lots of cool new products. 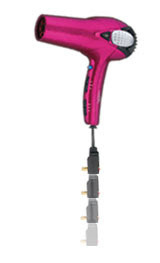 We were contacted by Conair about their new Infiniti Cord Keeper Styler. It as a retractable cord which is very useful for someone like me who has so many wores when I'm travelling. I have my curlers and straighteners, as well as all my chargers, and everything gets so tangled. And the retractable cord isn't the only good thing about it. It has 1875 watts of power, meaning its very powerful and makes styling a lot quicker. It has Ionic technology that causes silky and shiny hair, while reducing static and frizz. Let me know if any of you have ever used this, and how you found it. that t-shirt/magazine thing sounds amazing!! it's a nice t-shirt too. The T-Post shirts are very creative! It's such an interesting idea to take a piece of news and make a shirt about it. Very cool! I love this idea! It's fresh, new and innovative! You look good in the T!! Wow, that's pretty cool! Brilliant too that they minimize waste by only printing for subscribers, how many times have I wandered round the shops at the end of January sales knowing that everything unsold will probably end up in a landfill somewhere? I love the shirt idea, it's absolutely amazing. And I remember we had a debate in class over the death penalty! Oh, I love that t-shirt and need that hairdryer!! It was extremely interesting for me to read this article. Thanx for it. I like such themes and everything that is connected to them. I definitely want to read a bit more soon. I just bought the comair infiniti tourmaline dryer. I went with the "tourmaline" feature that is suppose to be a faster dry. Just used it this morning and its great. hope you enjoy the new version! That's such a great concept for a wearable magazine and tee. Definitely more innovative than the majority of the print media, which seems to cover the same thing anyway. Thanks for sharing! I love your t-shirt. It's very unique and cute. Hmm, interesting Tee, makes you think! Love that hair dryer, the retractable chords are amazing, I have one with that type of chord! wow such a nice Style n collection of T-Shirts.